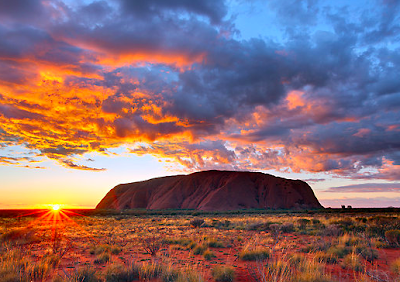 At 5:30am, and against every natural wish of my lazy lazy body, I got up in the cold Northern Territory desert pre-dawn to watch the sun rise over Uluru. I wore all the clothing I had with me; it reminded me of winter mornings in the UK. I was surprised how cold the desert was, despite knowing that deserts experience extremes of heat. I made my cold and numb way through the silent campsite, in the dark, to the meeting point. I had opted to go on a tour, which is unlike me, but the price of a hire car and my lack of local knowledge made a tour a far more sensible option. Besides, driving around the bush on my own, in the pitch black, at this time in the morning struck me as an especially bad idea. We were furnished with hot chocolate, tea, coffee and biscuits when we arrived at the sunrise viewing area and were very grateful. It was a short walk to the viewing platform and we made our way to it in the dark, guided only by tiny lights along the side of the pathway. A few more tours arrived but there was plenty of room. I spotted a few jealous looks aimed at my hot chocolate. We had arrived in the pitch black pre-morning and as the light increased slowly around us it became evident that the sunrise we were all looking forward to was going to be almost entirely obscured by cloud. Bugger. Still, ever the optimist at heart, I reassured myself with the thought that clouds often add interesting and dramatic effects to sunrises and sunsets. I waited hopefully and continued to take photos wondering if we’d even know if the sun had risen through all that cloud. Me and Uluru in the rain! Check whether or not your tour provides hot drinks. Don’t be the jealous person on a different tour!